Here’s a great example of how communities that do something different made a difference….in the lives of the kids they helped, and, as a result, in reduced police, juvenile justice, and medical costs to the community. The 4,400 teens in 24 small- to medium-sized towns in seven states that implemented the Communities That Care program had significantly fewer rates of smoking, drinking, vandalism, theft and fighting, according to this overview in HealthDay.com. Half of the 24 towns used the program, which was developed by researchers at the University of Washington. The half that did not change their approach to youth violence prevention acted as controls to see if taking a proactive approach, rather than a reactive — that is, waiting until kids got into trouble to intervene — made a difference. In the towns that participated, students in grades 5 through 9 took advantage of 17 different school-based, after-school, and parenting interventions. 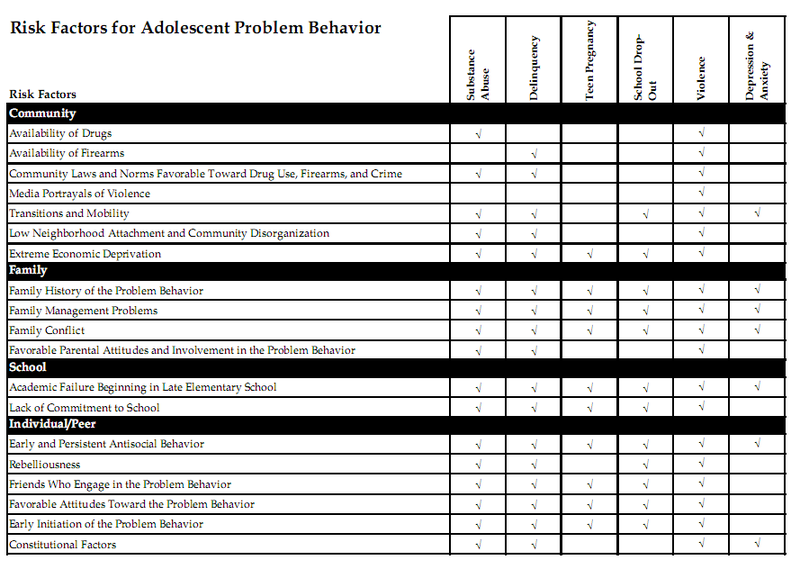 Each community did its own risk assessment using the table below and chose interventions from a list of 39 programs that had been tested and shown to be effective. Teens growing up in the towns using the prevention system had half the odds of ever having smoked a cigarette by tenth grade and had 21 percent lower odds of currently smoking in tenth grade compared with teens growing up in the towns without the system. They also had 38 percent lower odds of ever trying alcohol and 21 percent lower odds of initiating delinquent behavior by tenth grade. The tenth graders in the Communities That Care towns also reported 17 percent lower odds of engaging in delinquent behavior, such as stealing, vandalism and selling drugs, and 25 percent lower odds of engaging in violence, including physical fights. “We want to do the right thing to help our kids grow up to be healthy and lead productive lives, but historically, we haven’t demanded that the programs that we employ to do this are tested and proven effective,” said [J. David] Hawkins, who developed Communities That Care with Richard Catalano, a co-author and director of the Social Development Research Group [affiliated with the UW School of Social Work]. The research was published in the Archives of Pediatric and Adolescent Medicine. The Communities That Care program is funded by the National Institute on Drug Abuse, the National Cancer Institute, the National Institute of Child Health and Human Development, the National Institute of Mental Health, the National Institute on Alcohol Abuse and Alcoholism and the Center for Substance Abuse Prevention, which is part of the U.S. Substance Abuse and Mental Health Services Administration. I’ll be following up with Hawkins and people in the towns that used Communities That Care. That link, by the way, goes to a Wikipedia page that provides details of the program. This one goes to a page on UW’s Social Development Research Group site.